Do you enjoy poetry? What about artistic, visionary poetry? Picture this: over 75 poems of love, passion, rawness and connectivity from an artist's perspective; can you see it? 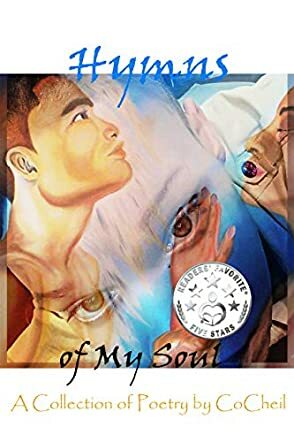 As you begin to read Hymns of My Soul by CoCheil, you will discover a collection of poetry which takes the reader on a journey. These poems will allow the reader to witness the creative literary prowess of a master writer. In poems such as Sunrise and Sunset, In Love, Intense and Breathlessness, you can feel the various emotions that CoCheil wants the reader to feel through the words on the pages. The poems reach out and speak to you, whether you are sitting at the beach, at the library or in the comfort of your home. As you begin to read each poem, you will be able to feel and connect with each one. I really enjoyed this set of poems because their beauty touched me in so many ways. Reading words in this book of vulnerability and intensity when expressing love of another and emotions such as “…but not as breath-taking as you...Seeing you today made me feel some type of way” or “No emotion I can hide, and if I trust you, I will let you inside” depicts the love in essence of rhythm or rhyme that CoCheil expresses so masterfully. I loved how the words put my mind in sync with the visions portrayed within the words of the poems. If you're looking for some hope in the form of art, add this book to your library.